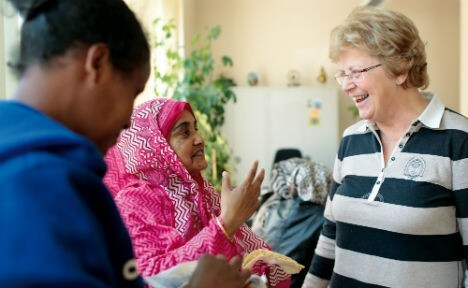 A new survey conducted by the Protestant church shows that Germans’ willingness to help refugees remains steadfast, despite concerns the country will struggle to cope with the large influx. The survey conducted by the Protestant church shows that a majority of those asked (51 percent) are prepared to support a refugee home in their neighbourhood, reports Focus. Many had already backed up this desire with action. 11 percent of the more than 2,000 people surveyed said they had already helped in looking after or housing refugees, and a similar number said they were currently doing so. Thirty seven percent of respondents said they had made donations to refugees and 48 percent said they would be prepared to make a financial donation. In addition, 13 percent said they were prepared to take a refugee into their home. The survey also showed great optimism about the benefits that the refugee crisis would bring to Germany, with 88 percent saying the country’s willingness to help would have positive effect on it. But at the same time there was widespread fear that the far right could profit from anxieties unleashed by the crisis. Eighty five percent of respondents said their biggest fear was a rise in right-wing extremism as a reaction against refugees. People were still hesitant to say whether they thought the country could cope with the over a million people who have applied for refugee status over the course of 2015. To the question of whether Germany could cope with the challenge of the refugee crisis, 16 percent said “certainly not”. A large majority (60 percent) could not make up their minds. “Skepticism and confidence are balanced against one another,” said Ulrich Lilie, head of the Protestant deanery.